One Canadian Fallout: New Vegas cosplayer ended up being confronted by the police after his costume alarmed some people last week. When you're going to get your Fallout: New Vegas costume altered, it's probably best not to wear it as you walk to the tailor. That's what one Canadian cosplayer found out last week. 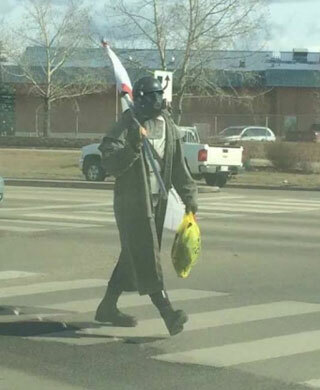 According to CBC News, the unnamed cosplayer was walking through the city of Grand Prairie in Alberta, Canada dressed in a long cost, gas mask, helmet, armor, and a bullet belt. He was also carrying a New California Republic flag. The Royal Canadian Mounted Police received a number of calls from citizens who were worried that the man was wearing a bomb strapped to his back. As you can imagine, this prompted a rapid police response, with at least eight officers responding. Photos show them in cover with rifles in hand. RCMP Cpl. Shawn Graham said, "He was observed going into a business, so the RCMP members were able to safely remove the staff members from the business." The business the man entered was Lynn's Alterations, where he was having work done on the costume he was wearing. After contacting the owner and asking if he could see any wires on the individual, police asked the owner to exit the business by the back door. They then made contact with the cosplayer, and after talking with him, "were able to determine that he was wearing a costume and there was no threat to the public." The man was taken into custody and then released without any charge being filed. The silver tubes that some callers had mistaken for bombs were actually Pringles potato chip cans that were painted silver. Graham said, "We have to believe everything is real until proven otherwise. In the end you've got a good feeling after going, 'OK, there wasn't a bomb, there was no intent to do anything criminal, it's just someone with their costume.'" He also offered a warning to other cosplayers, saying, "There's a time and a place for it," such as conventions and other events, but "Wandering around downtown [is] maybe not the place to do it."